Odaiba is a popular spot for families and couples, where you can look out over Tokyo Bay. It's a spot we highly recommend for visitors to Japan as well. Today we will be introducing a superb view spot you can walk to. Odaiba is a popular spot for families and couples, as it allows an unhindered view over Tokyo Bay. It is a place we highly recommend to visitors to Japan as well. Today we will be introducing a superb view spot you can walk to. Odaiba is a man-made island originally created for military purposes. However, it is currently covered with large commercial complexes, television buildings and many other amusement facilities. 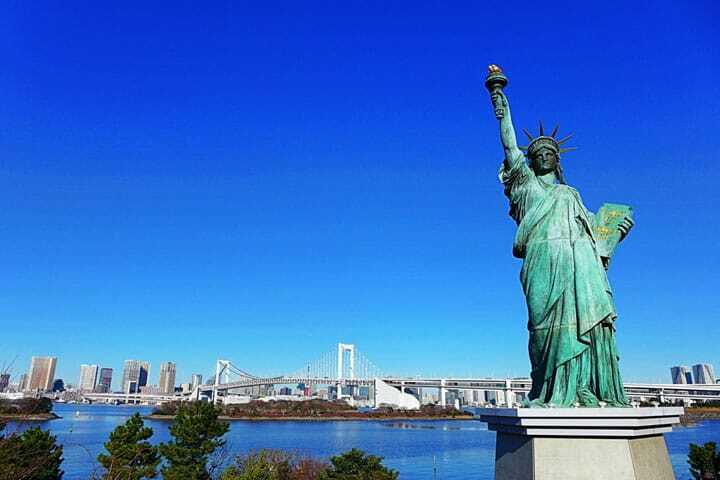 Odaiba also has a spectacular view and spots that are ideal for taking pictures, including the symbolic Statue of Liberty, Rainbow Bridge and the large Ferris wheel. The atmosphere of this place is more like a futuristic city rather than that of traditional Japan. The fresh air and blue ocean create a sense of openness and liberty. This is a view of Odaiba shot from the observatory of the Japanese TV station Fuji Television. The large bridge that can be seen in the middle is called "Rainbow Bridge" and it connects the central part of Tokyo and Odaiba. A little-known fact about the Rainbow Bridge is that you can walk across it! Even many Japanese people don't know that you can take a walk across the Rainbow Bridge. We decided to try it out! ※Crossing on a bicycle is prohibited. Recommended Places In Odaiba – A Trip For The Whole Family! We will leave from the JR Shimbashi station. At Shimbashi station we transfer to the Monorail line "Yurikamome". We get off at the fourth station from Shimbashi, Shibaura-futō station. Outside the east exit is a narrow road like this. Next you will find a direction board guiding you toward the Rainbow Bridge on the right. We will be walking along right this way! A little on, a crosswalk comes into view. We continue to go straight. After walking for a few minutes, the entrance to Rainbow Bridge appears on the right. Now we will go right up to the seventh floor on an elevator. We have arrived at the Rainbow Bridge promenade. Walk straight to the right, toward Odaiba. Just so you know, the wind here is pretty strong, so make sure your hats or other belongings don't get blown away! On the right side of the walkway you will have this view. After about 10 minutes of walking, the Ferris wheel and the Fuji Television building, as well as the Daiba Park (Dai-san Daiba) comes into view. Odaiba is getting near! We did it. The appearance of this large direction board indicates our arrival to Odaiba! Looking back, the beautiful Rainbow Bridge we just walked across can be seen. The bustling crowds of Odaiba is fun too, but how about trying the calm and relaxing Rainbow Bridge walk before you get there?